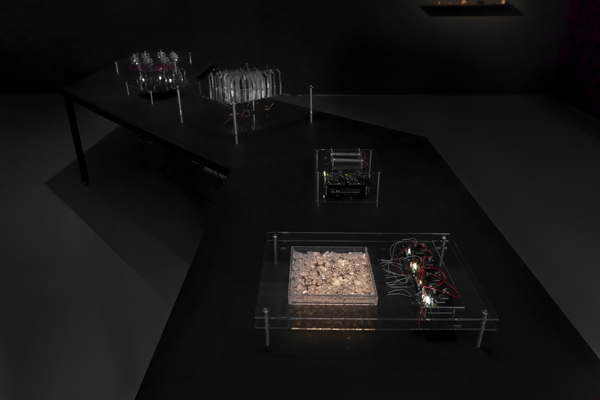 IRRATIONAL COMPUTING investigates material, aethetics and potential of digital processes. The basic raw materials of our surrounding information technology are semiconductor crystals such as silicon, quartz or silicon carbide, which, thanks to today’s advanced microtechnology and extremely sophisticated procedures, are processed into transistors or integrated circuits (IC), with the materiality of modern microprocessors having long since ceased to be graspable. The extreme miniaturization and the black-box set-up elude visual interpretation. The Installations circuit runs counter to the developments in information technology, representing the system in a dimension that is enlarged many times over. The project thus corresponds to an extreme zooming-in on the smallest “physical” units of digital processes. Irrational Computing / Documentation from Ralf Baecker on Vimeo. Ralf Baecker (DE) works as an artist in the fields of visual and media art. He has studied computer science and media art in Cologne. He was teaching fellow at the Bauhaus University Weimar (DE) and University of the Arts Bremen (DE). Baecker builds installations and sculptures that deconstruct the fundamental elements of symbolic processes. His work has been exhibited internationally. eg. ZKM Karlsruhe (DE), Konsthall Malmö (SE), NiMK Amsterdam (NL), Martin-Gropius-Bau Berlin (DE), Laboral Centro de Arte Gijon (ES), Center for Contemporary Art WINZAVOD Moscow (RU).